Oshun is the Orisha African Goddess of love, beauty and marriage beautifully depicted in this bronze resin 9 inch statue. Oshun is the orisha of the fresh waters, the goddess of the river that shares her same name. She brings prosperity and fertility to her worshipers and especially watches over the poor and the sick as she is said to heal the sick with the power of water. Oshun is also the orisha of love, beauty and marriage. She is often depicted as a beautiful woman or a mermaid. With the African diaspora, Oshun was brought to the Americas and adopted in the Cuban, Brazilian and Haitian religious belief systems. 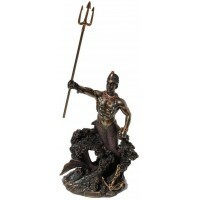 This beautifully finished cast bronze resin state stands 9 1/2 inches high with hand painted accents. Item Number: UI-WU75957A4 | Approximate Size (Inches): 3.50 wide x 3.50 deep x 9.50 high | Approximate Shipping Weight: 3.00 lbs.